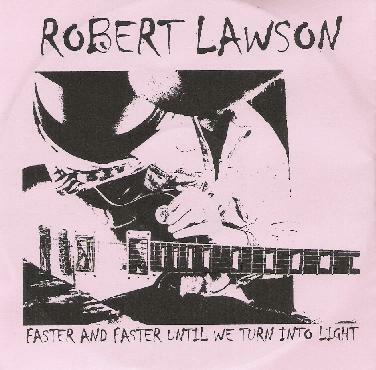 Robert Lawson - "Faster and Faster Until We Turn Into Light"
Robert Lawson is a Scottish guitarist living in Spain, who makes all sorts of music and has been playing in bands for 20 years. . The 7 instrumental tracks in 29 minutes featured here are his latest excursions. The backing music is quite basic on the tracks, which are only the backdrop for his guitar playing. Sometimes it is more psych rock, other times a lazy slide (track 2 - Half Drugged with Sloth & Luxury), and more jazz to space rock (Open Like A Tunnel). Nautical Hoedown/Weeper opens the CD and is a slow, sort of jazzy piece. The Red Beard and the Broom features several layers of guitar and is quite noodley. The Monstrous Lapse of a Mainly Kindly Soul again features some nice, sort of spacey slide guitar. Some kind of Flow has a very strange flow and he really experiments with bouncing the guitar back and forth with the bass lines. The Smiling Leeming, the Parrot and the Ox ends the CD and is quite a spacey number, the only one like it on the CD. Quite cool experimental stuff. I enjoyed it!